Do not pass the opportunity to visit the Annamalai University situated in the ancient city of Chidambaram. 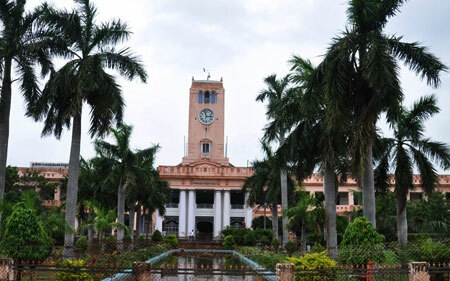 Located amidst the hubbub of Chidambaram the Annamalai University was built by Dr. Rajah Sir Annamalai Chettiar in 1929, it was the first private university and one among the oldest in India. Chidambaram is one of the holiest places in South India as it houses the most beautiful idol of Lord Nataraja in his divine dancing form. The name of this city, Chidambaram, comes from the Tamil word “Chitrambalam” also meaning ‘wisdom atmosphere’. This was a land ruled by the Pallavas, Cholas, Pandyas, Marathas and the British Empire. During your visit to Chidambaram, do plan a trip to the Thillai Nataraja temple where you can catch a sight of the beautiful Nataraj idol. The name of the temple came to be called ‘Thillai Nataraja’ because of the ancient variety of Thillai trees growing around the temple. During the festival of Arudra Dharshan the idols of Lord Nataraja and Shivakama Sundari are taken around the town to the rhythmic sound of Nadaswaram. At this festival you will notice that the streets are lined with beautifully decorated colorful Kolam art reveled by the womenfolk. Chidambaram is also one among the three places in India which has a Mangrove forest and it is the world’s second largest mangrove forest. You can take a boat ride inside the forest and view the dense canopy of the trees or if you are lucky you might even catch sight of rare birds that flock through the forest all year long. The water in the forest is sea water that flows in and out naturally which is the only source of living for the trees and wildlife in the forest. As evening dusks, you will feel the cool sea breeze wafting through your body from the beaches nearby. The nearest beach from the Annamalai University is the beach located at Samiyarpettai. You can take a car there as you will enjoy the sceneries and the customary village ‘Santhai’ on the route. The Annamalai University offers a vibrant lot of places for tourists and you have to visit the place to experience the beauty and serenity of the city.